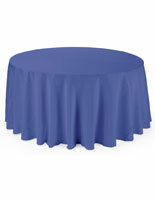 This Blue Table Skirt for Trade Shows Makes Tables Stand Out! Many Marketers and Vendors have Company Logos Custom Printed for More Exposure! 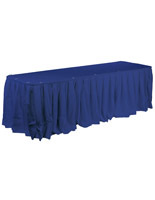 See Which Table Skirt is Right for Your Application! 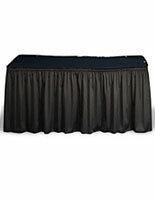 This top quality table skirt is perfect for all your hotel, restaurant, retail, or trade show needs. 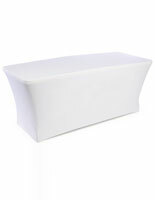 The package includes the skirting, matching table topper, and ten plastic clips for 3/4" or 1-3/4" table edges. 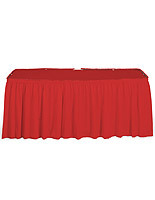 This shirred table skirt works for either 6' for 8' foot long tables that stand 30" high. The cover will go all the way around the edges of a six foot table or it will surround most of an 8' table, leaving only a 4 foot gap in the middle of the back. 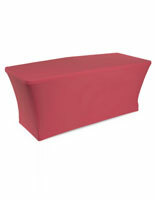 The durable fabric falls within 1" of the floor on all sides. 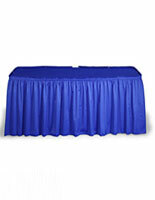 This table skirt is very durable and flame retardant. All orders are shipped with a flame retardant certificate from an independent testing laboratory. The fabric is also machine washable and dryable. 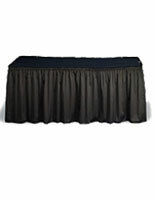 The table skirt measures 17-1/2 feet in length and is 29" tall.